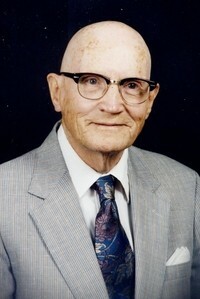 Cecil Earnest Goode 96 of Glasgow died Monday, June 6, 2011 at the Barren Co. Health Care Facility. Born in Nobob community of Barren County on March 5, 1915 he was the son of the late William L. & Lela May Cary Goode. He was reared in Barren County and Indiana. He attended Purdue University obtaining both Bachelor’s and Master’s degrees. He was married to the late Dorothy Gene Bryant of Bloomfield, IN and they had three children, the late Cecil Earnest Goode, Jr., Richard Bryant Goode of Pullman, WA and Mrs. Greg Lowe (Marilyn) of Jefferson, GA. He and his wife had three grandchildren Joseph Keith Goode, Jennifer Mary Gene Stockwell and Robert Alexander Gregory Lowe and twin great grand-sons William Gregory Stockwell and Benjamin James Stockwell. Mr. Goode served in the Army Air Corps during World War II, progressing to the rank of Captain. Before coming back to Glasgow in 1976, Mr. Goode was engaged in international administration as Deputy Director of the Administrative Management service, United Nations Secretariat, in New York. With the Federal Government in Washington, he served for thirty years in the Office of Management and Budget, Hoover Commission, Department of Defense, Federal Civil Defense Administration, Veteran’s Administration, Office for Emergency Management and Federal Housing Administration. He served as Director of Personnel in the Federal Civil Defense Administration. In the Bureau of the Budget he was Deputy Director of the Management Improvement and Research Branch. He started his career in 1938 with Bureau of Personnel in the Indiana state government. Since returning to Glasgow, he served as a part-time consultant to state and local governments and the United Nations. Mr. Goode was editor for five years of Personnel Administration magazine, and for eleven years served as part-time professor of business and public administration at George Washington University. In 1957, he published a nationwide review of personnel research entitled Personnel Research Frontiers, which was financed by the Ford Foundation. He served as National President of the Society for Personnel Administration and as Executive Director of the National Civil Service league. Public Archives, President of the South Central Kentucky Historical and Genealogical Society and as a member of the Kentucky Legislative Board of Ethics. He helped to found the Barren County Historical Foundation. He edited Barren County Heritage in 1980, authored Heart of the Barrens in 1986, World Wonder Saved on Mammoth Cave in 1986, Southern Kentuckians in 1990 and Yesterday and Today in 1995. He has also published two family genealogies, his own, Kentucky cousins, and his wife’s Pike County, IN kin. For more than 25years he had written a column of local history and commentary in the Glasgow Daily Times. He was a member of the First United Methodist Church in Glasgow. Funeral services will be 10:00am Friday, June 10, 2011 at the A. F. Crow & Son Funeral Home with burial in the Glasgow Municipal Cemetery. Visitation will be from 5:00-7:00pm on Thursday evening at the funeral home and Friday morning from 8:00am until time for services.